From the “not happy feet” department and the “prospects look grim” climate model comes this mostly emotional bit of science PR. Please send money for more research too. If projections for melting Antarctic sea ice through 2100 are correct, the vanishing landscape will strip Emperor penguins of their breeding and feeding grounds and put populations at risk. But like other species that migrate to escape the wrath of climate change, can these iconic animals be spared simply by moving to new locations? According to new research led by the Woods Hole Oceanographic Institution (WHOI), they cannot. Scientists report that dispersal may help sustain global Emperor penguin populations for a limited time, but, as sea ice conditions continue to deteriorate, the 54 colonies that exist today will face devastating declines by the end of this century. They say the Emperor penguin should be listed as an endangered species. The study was published in the June 6, 2017 edition of the journal Biological Conservation. The relationship between Emperor penguins and sea ice is a fragile one: Too little sea ice reduces the availability of breeding sites and prey; too much sea ice means longer hunting trips for adults, which in turn means lower feeding rates for chicks. Only in the past few years have scientists become aware of the penguins’ ability to migrate to locations with potentially more optimal sea ice conditions. 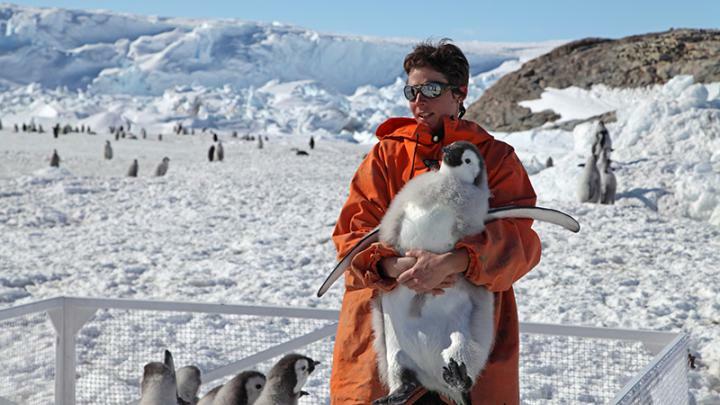 To determine whether migration will ultimately help Emperor penguins defend against population decline, Jenouvrier worked with mathematicians to develop a sophisticated demographic model of penguin colonies based on data collected at Pointe Géologie, one of the few places where long-term Emperor penguin studies have been conducted. The model tracks the population connectivity between penguins as they take their chances moving to new habitats offering better sea ice conditions. “It’s like we’ve added roads between the cities the penguins live in and now get to see what happens when they travel between them,” she said. A range of model inputs were used, including penguin dispersal distance, behavior and rate of migration. The model also factors in end-of-century sea ice forecasts from climate projection models to predict the fate of each colony. According to Shaye Wolf, climate science director for the Center for Biological Diversity, the new modeling technique is key to informing policy around “much-needed protections” for the Emperor penguin. One surprising aspect of the study, according to Jenouvrier, was the wide range of penguin responses to various dispersal scenarios represented in the model. In some cases, dispersal boosted populations whereas in other cases, it led to dramatic declines. The researchers conclude that while dispersal can be a very potent response to climate change in certain cases, the projected accelerated pace at which ice is melting in Antarctica makes for a tricky dynamic. Climate change isn’t stationary, so even if Emperor penguins move to locations with better sea ice conditions, those conditions could change dramatically from one year to the next. The new findings will help inform a scientific status review launched in 2014 by the U.S. Fish and Wildlife Service aimed at determining if the Emperor Penguin should be protected under the Endangered Species Act. Wolf views the study as confirmation that climate change is putting the animals in danger, and as such, agrees with Jenouvrier that protection is in order. “Decisions to protect species under the Act must be based on science and not politics, so we hope the Fish and Wildlife Service will heed the science and give Emperor penguins the protections they deserve,” she said. Next article Which Nation is Most Vulnerable to Climate Change?